And it makes me feel crappy. Tired. Unhappy. Disappointed in myself for my lack of self-control or care. The irony is I feed Maya so carefully, trying to ensure her meals are balanced and healthy, include lean proteins, whole grains, healthy fats, plenty of veggies and always fruit for dessert (plus sometimes a nibble of a cookie or something if we have it). And while I do eat those things, too, I’m still an emotional eater (read as: sugar-freak) — and the emotions that drive me to eat range from content and happy to angry and sad. There’s no rhyme or reason; I just like to eat and, admittedly, find comfort in food. I’m sure it doesn’t help that the past few days have been challenging here on the home front (marriage isn’t always easy!) — and I’m definitely a girl who eats her feelings … regardless of knowing 1) it solves nothing and 2) only makes me feel worse. So tonight I’m making a public commitment not to let my emotions get the best of me and I am going to reverse food journal (offline) to help me achieve this goal. Each day I say “I’ll do better.” And then I don’t. Somewhere along the way I’ve lost my moral food compass. No, I don’t ever want to go back to that miserable, calorie-counting, obsessed Melissa whose compass made her a really annoying person to be around. But I do need some accountability and I have just tossed it out the window lately. While it’s much more fun to go out to eat now that I eat more than a salad with chicken … I still can’t throw caution completely to the wind. It’s not healthy, and it’s not how I want to be. I know I have the ability to find that gray, middle-ground yet again. I’ve just been eating my feelings and the insanity needs to stop. I can’t be a good role model for Maya if I’m being a total hypocrite. If I wouldn’t give her five cookies after dinner, I shouldn’t be eating five cookies, either. It’s that simple. Yet anyone who is an emotional eater knows that it isn’t as simple as it sounds. Emotional eating is a complicated beast. I’ve read tons of literature about it, but experience tells me there is no easy fix. We have to work on what’s driving us to eat first … or, most important, focus on how we respond to stress/joy/etc. Because something triggers emotional eating; it doesn’t just happen out of nowhere. It needs a spark. And, though it usually does for me, the spark doesn’t always need to result in a burning flame. Sometimes, we just need to put the fire out, period (i.e., sit with our feelings, resist the urge to eat our feelings). More than three years recovered now from my ugly past, I can say with certainty I’d never go back to those behaviors … but I’d be lying if I didn’t admit that emotional eating is still my Achille’s heel. I still have work to do. For me, and the little girl you see here in this picture. 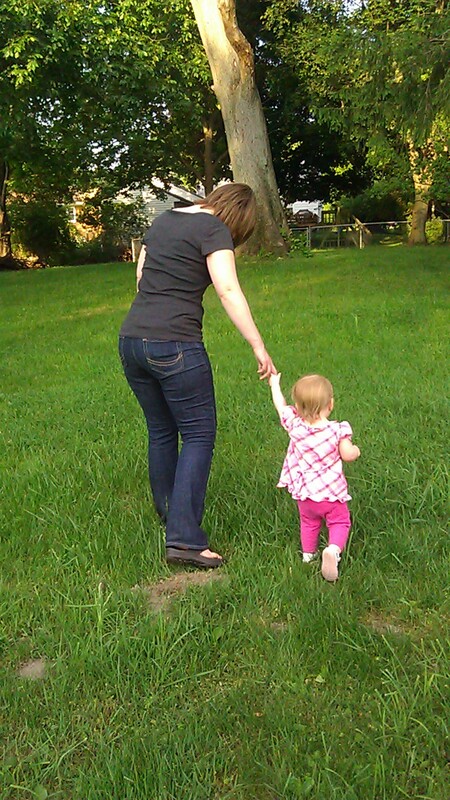 I can’t hold her hand forever … but while I am doing it, I want to be a good role model. How about you? What are your best tips for combating emotional eating? I know just how you feel! All of 2011 was a sugar bender for me – and I don’t even really like sweets! I don’t think I ate a green vegetable all year. I finally got back on track in December, when my husband and I made a pact to eat better. We both use LoseIt on our iPhones (not to lose weight, but to track our food). For the first time since I found out I was pregnant in 2008 I feel good about the way I’m eating. In my experience it takes a couple weeks to break the sugar addiction and then it’s much easier to stay on track. I am so glad to hear you were able to overcome the sugar addiction!! Hi Suzy, I definitely think I need to sit on it … This week’s challenges are not what has been causing me strife the past few months, but I am certain I don’t easily sit with my feelings … and I need to. Great advice, thanks! Thanks so much for the tips everyone! Glad to know I am not alone!